A TORMENTOR’S TALE Roaming the earth for centuries, seeking souls to torment and devour, has lost its appeal for Nacham. He wants it all to end. He longs to return to his previous role as a servant in unbroken devotion to his Creator. But that life is gone forever. Nacham’s past failed tormenting assignments currently restrains him to be bound to the descendants of the Hemlock family, a long line of wicked, narcissist, and murderous women. After the death of Wynter Hemlock from breast cancer, daughter Willow becomes Nacham’s new subject. Willow Hemlock is kind and compassionate, just as her father prayed she would be, since before her birth. She seeks to find authentic love in her relationships. And she possesses holy traits of Heaven, which Nacham longs to experience again. Willow is hope to Nacham. The salvation of her soul would break his binding to her, and the Hemlock family line, bringing freedom for Nacham, as well as an end to the incessant evil deeds he is asked to perform. When Willow faces a crisis of faith, Nacham is granted an unusual mission from the Throne room of Heaven. He is allowed to venture to the other side of the veil that separates the physical and spiritual worlds, take on a human-like form, to communicate with Willow. Will his tale of torment save Willow from losing her faith? A TORMENTOR’S TALE provides a (biblically-researched) peek behind the veil separating the physical and spiritual worlds, to the eye-opening spiritual warfare that takes place all around us. In the spiritual vein of C.S. Lewis’ THE SCREWTAPE LETTERS, this novel reveals the subtle yet successful strategies of the forces of darkness to thwart the spiritual lives of human beings. Pull back the veil, and discover for yourself the battles between dark and heavenly spirits, which rage all around us, in A TORMENTOR’S TALE. A TORMENTOR’S TALE Roaming the earth for centuries, seeking souls to torment and devour, has lost its appeal for Nacham. He wants it all to end. He longs to return to his previous role as a servant in unbroken devotion to his Creator. But that life is gone forever. Nacham’s past failed tormenting assignments currently restrains him to be bound to the descendants of the Hemlock family, a long line of wicked, narcissist, and murderous women. After the death of Wynter Hemlock from breast cancer, daughter Willow becomes Nacham’s new subject. Willow Hemlock is kind and compassionate, just as her father prayed she would be, since before her birth. She seeks to find authentic love in her relationships. And she possesses holy traits of Heaven, which Nacham longs to experience again. Willow is hope to Nacham. The salvation of her soul would break his binding to her, and the Hemlock family line, bringing freedom for Nacham, as well as an end to the incessant evil deeds he is asked to perform. When Willow faces a crisis of faith, Nacham is granted an unusual mission from the Throne room of Heaven. He is allowed to venture to the other side of the veil that separates the physical and spiritual worlds, take on a human-like form, to communicate with Willow. Will his tale of torment save Willow from losing her faith? 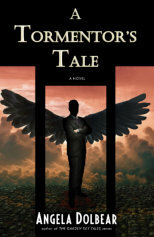 A TORMENTOR’S TALE provides a (biblically- researched) peek behind the veil separating the physical and spiritual worlds, to the eye- opening spiritual warfare that takes place all around us. In the spiritual vein of C.S. Lewis’ THE SCREWTAPE LETTERS, this novel reveals the subtle yet successful strategies of the forces of darkness to thwart the spiritual lives of human beings. Pull back the veil, and discover for yourself the battles between dark and heavenly spirits, which rage all around us, in A TORMENTOR’S TALE.